Most users ask about this as CATT is increasingly used for designing complex sound systems. Directivity files written specifically for CATT (SD1 formats) are available for Philips, L-Acoustics, Duran Audio, Meyer, d&b, Peavey and Martin speakers among others. 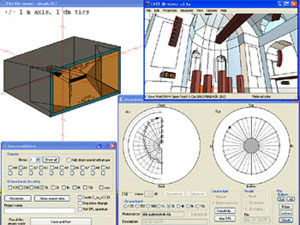 In addition, loudspeaker directivity files exported from EASE v2 can be converted to CATT SD1 format using a program available from the CATT user website. This can either be done by access to EASE libraries or by requesting the open format export files (.EXP) from each manufacturer. SD1 files are speaker directivity files in a standard format, assuming that the directivity does not change with distance from the loudspeaker. This is not accurate when you are in the near field of the loudspeaker, which is important when dealing with large column loudspeakers and arrays. This is important - after all, the whole reason why a column loudspeaker "beams" sound is that it has a large near field and is designed for the listener to be in that near field. 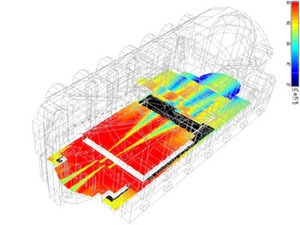 Hence CATT also developed a dynamic directivity format (SD2) which offers array modelling (very high resolution distance dependent directivity) and a very general handling of directivity. SD2 offers a much higher resolution than the 10-degree "industry standard". In CATT v9.1 and TUCT2, the SD2 format has now been superseded by a freely-editable CTA array format. Arrays can be made up from any point-source elements defined in SD0, SD1 or CLF files but, uniquely, can also feature line source elements, such as ribbon tweeters, and incoherent arrays (for instance to model noise generated along a line source such as a conveyor belt). For now, TUCT1 is also included with CATT v9.1 to preserve compatibility with SD2 and older source formats.